Here is the latest in my link-listing series. Also check out my ASP.NET Tips, Tricks and Tutorials page for links to popular articles I've done myself in the past. Over the last few weeks I've been writing a series of blog posts that cover LINQ to SQL. LINQ to SQL is a built-in O/RM (object relational mapper) that ships in the .NET Framework 3.5 release, and which enables you to model relational databases using .NET classes. 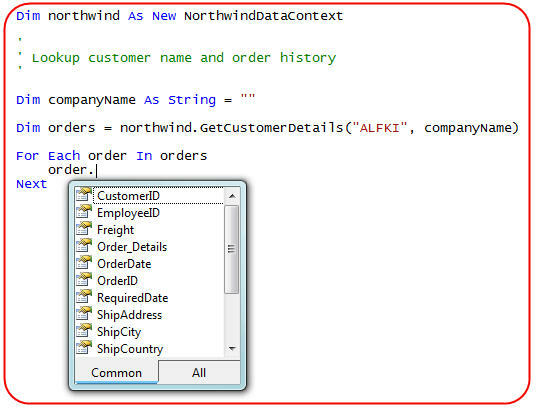 You can use LINQ expressions to query the database with them, as well as update/insert/delete data. 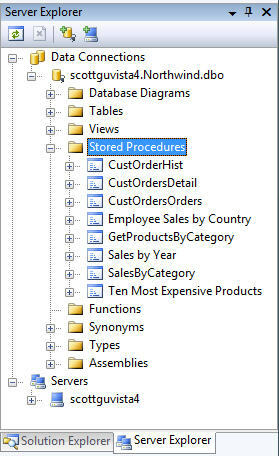 In my last two posts (Part 6 and Part 7) I demonstrated how you can optionally use database stored procedures (SPROCs) to query, insert, update and delete data using a LINQ to SQL data model. One of the questions a few people have asked me since doing these posts has been "what if I want total control over the SQL expressions used by LINQ to SQL - but I don't want to use SPROCs to-do it?" Today's blog post will cover that - and discuss how you can use custom SQL expressions that you provide to populate your LINQ to SQL data model classes, as well as perform insert, updates, and deletes. 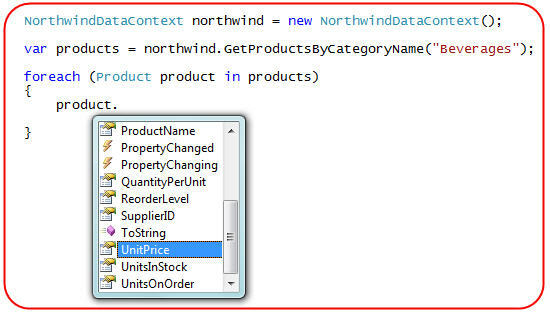 In Part 3 of this blog series I covered how you can use the new LINQ language support in VB and C# to query the above data model classes and return back a set of objects that represent the rows/columns in the database. 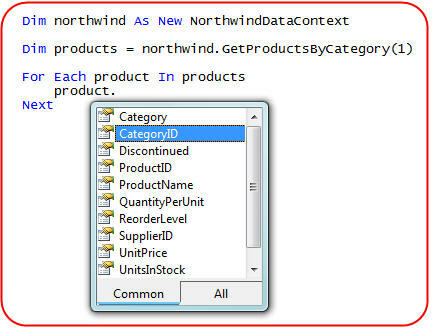 When the LINQ expression within our "GetProductsByCategory" method is evaluated, the LINQ to SQL ORM will automatically execute dynamic SQL to retrieve the Product data and populate the Product objects. 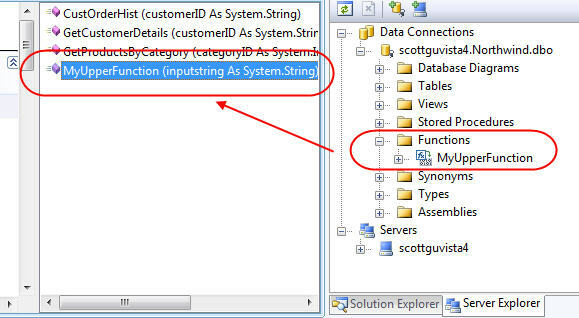 You can use the LINQ to SQL Debug Visualizer to see in the debugger how this LINQ expression is ultimately evaluated. In our sample above we didn't have to write any SQL code to query the database and retrieve back strongly-typed Product objects. Instead, the LINQ to SQL ORM automatically translated the LINQ expression to SQL for us and evaluated it against the database. But what if we wanted total control over the SQL that is run against our database, and don't want LINQ to SQL to-do it for us in this scenario? One way to accomplish this would be to use a SPROC like I discussed in Part 6 and Part 7 of this series. The other approach is to use the "ExecuteQuery" helper method on the DataContext base class and use a custom SQL expression that we provide. The ExecuteQuery method takes a SQL query expression as an argument, along with a set of parameter values that we can use to optionally substitute values into the query. Using it we can execute any raw SQL we want against the database (including custom JOINs across multiple tables). What makes the ExecuteQuery method really useful is that it allows you to specify how you want the return values of your SQL expression to be typed. You can do this either by passing a type-object as a parameter to the method, or by using a generic-based version of the method. But unlike before it will be our custom SQL expression that will run against the database - and not dynamic SQL executed in response to using a LINQ query expression. 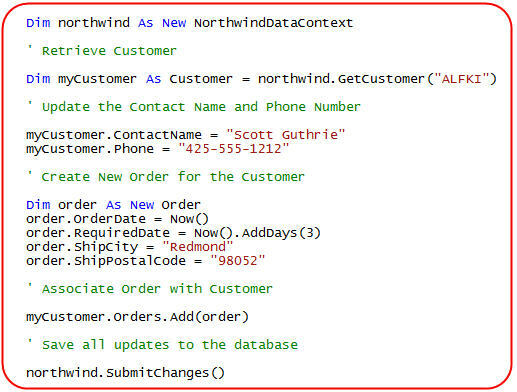 By default when you retrieve a data model object using LINQ to SQL, it will track all changes and updates you make to it. If you call the "SubmitChanges()" method on the DataContext class, it will then transactionally persist all of the updates back to the database. 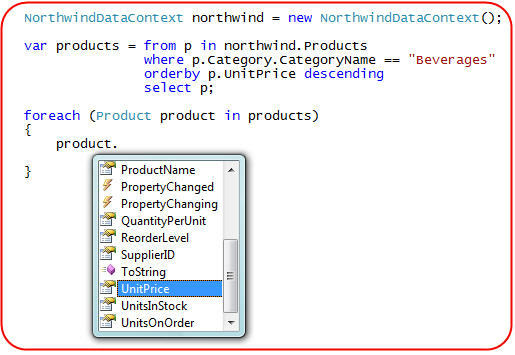 I cover this in more depth in Part 4 of this LINQ to SQL series. 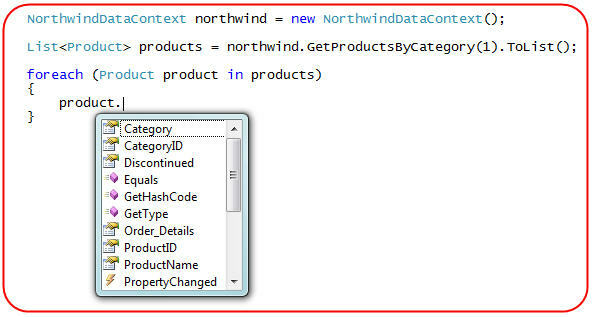 Because we typed the return value of our ExecuteQuery call in the GetProductsByCategory method to be of type "Product", LINQ to SQL knows to track the Product objects we returned from it. When we call "SubmitChanges()" on the context object they will be persisted back to the database. The ExecuteQuery() method allows you to specify any class as the return type of a SQL query. The class does not have to be created using the LINQ to SQL ORM designer, or implement any custom interface - you can pass in any plain old class to it. In addition to using custom SQL expressions for queries, we can also execute them to perform custom Insert/Update/Delete logic. The LINQ to SQL ORM automatically generates and executes dynamic SQL to perform queries, updates, inserts and deletes against a database. For advanced scenarios, or cases where you want total control over the SQL query/command executed, you also have the ability to customize the ORM to use either SPROCs, or your own custom SQL Expressions, instead. This provides you with a great deal of flexibility when building and extending your data access layer. In future blog posts in this series I'll cover some remaining LINQ to SQL concepts including: Single Table Inheritance, Deferred/Eager Loading, Optimistic Concurrency, and handling Multi-Tier scenarios. In part 6 I demonstrated how you can optionally use database stored procedures (SPROCs) and user defined functions (UDFs) to query and retrieve data using your LINQ to SQL data model. In today's blog post I'm going to discuss how you can also optionally use SPROCs to update/insert/delete data from the database. After defining our data model classes and relationships we'll want to add some business logic validation to our data model. We can do this by adding partial classes to our project that add validation rules to our data model classes (I cover how to-do this in-depth in my Part 4: Updating our Database LINQ to SQL tutorial). For example, we could add validation rules to enforce that the Customer's phone number follows a valid phone pattern, and that we don't add Orders where the customer's RequiredDate for delivery is before the actual OrderDate of the Order. Once defined in partial classes like below, these validation methods will automatically be enforced anytime we write code to update our data model objects in an application. Now that we have our data model classes created, and have applied validation rules to them, we can query and interact with the data. We can do this by writing LINQ expressions against our data model classes to query the database and populate them (I cover how to-do this in my Part 3: Querying our Database LINQ to SQL tutorial). Alternatively we could map SPROCs to our DataContext and use them to populate the data model classes (I cover how to-do this in my Part 6: Retrieving Data using Stored Procedures LINQ to SQL tutorial). We now have a data access layer that encapsulates our data model, integrates business validation rules, and enables us to query, update, insert, and delete the data. LINQ to SQL monitors the modifications we make to the objects we retrieve from the DataContext, and keeps track of all of the objects we add into it. 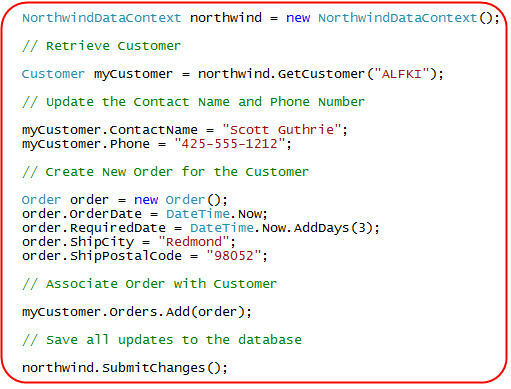 When we call DataContext.SubmitChanges() at the end, LINQ to SQL will check that our business logic rules are valid, and if so automatically generate the appropriate dynamic SQL to update our Customer record above, and insert a new record into the Orders table. Hang on a second - I thought this post was about using SPROCs??? If you are still reading this, you might be feeling confused about where SPROCs fit into this post. Why did I show you above how to write code that works with our data model objects, and then causes dynamic SQL to run? Why haven't I showed you how to call a SPROC for doing inserts/updates/deletes instead yet? The reason is that the programming model in LINQ to SQL for working with data model objects backed by SPROCs is the same as those updated via dynamic SQL. The way you add data model validation logic is exactly the same (so all the validation rules on our data model classes above still apply when we use SPROCs). The code snippet above where we use our data access layer to retrieve a customer, update it, and then add a new order associated with it is also exactly the same regardless of whether we are using dynamic SQL for updates, or whether we have configured our data model classes to use SPROCs instead. This programming model symmetry is powerful both in that you don't have to learn two ways of doing things, and also because it means that you don't have to decide up front at the beginning of your project whether you are going to use SPROCs or not. You can start off using the dynamic SQL support provided by the LINQ to SQL ORM for all queries, inserts, updates and deletes. You can then add your business and validation rules to your model. 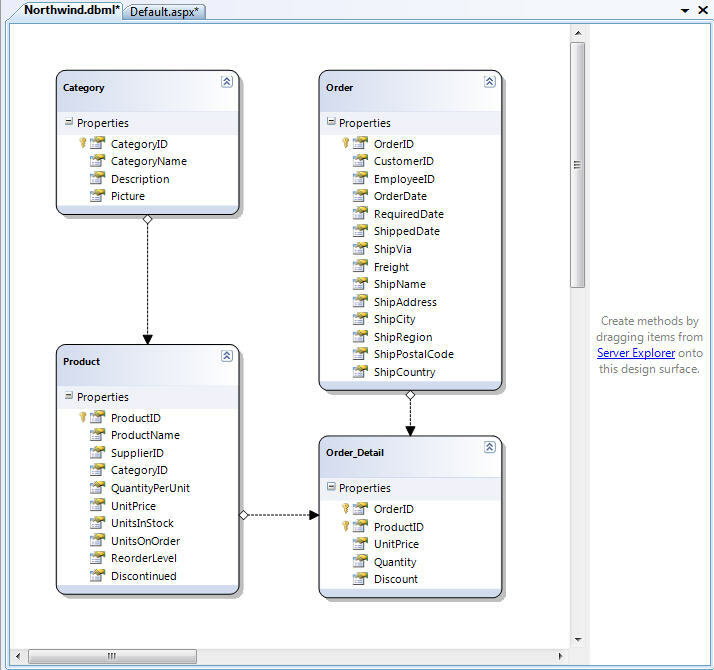 And then later you can optionally update your data mapping model to use SPROCs - or not if you decide you don't want to. The code and tests you write against your data model classes can stay the same regardless of whether you use dynamic SQL or SPROCs. We'll now spend the rest of this blog post demonstrating how we can update the data model we've built to use SPROCs for updates/inserts/deletes - while still using the same validation rules, and working with the same code snippets above. 1) By using the LINQ to SQL designer to graphically configure SPROCs to execute in response to Insert/Update/Delete operations on our data model classes. 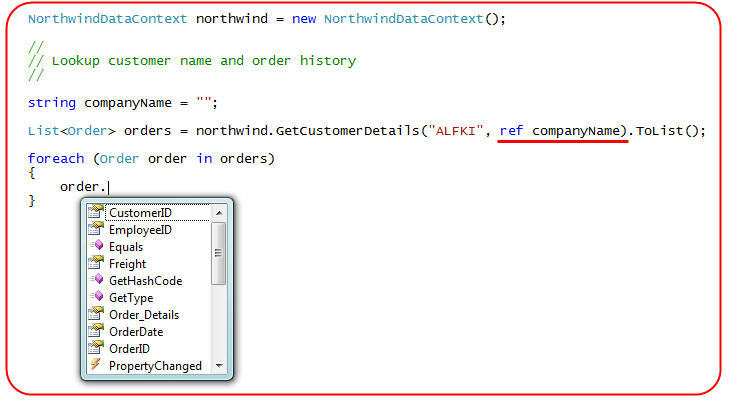 2) By adding a NorthwindDataContext partial class in our project, and then by implementing the appropriate Insert/Update/Delete partial methods provided on it (for example: InsertOrder, UpdateOrder, DeleteOrder) that will be called when we insert/update/delete data model objects. These partial methods will be passed the data model instances we want to update, and we can then execute whatever SPROC or SQL code we want to save it within the database. When we use approach #1 (the LINQ to SQL designer) to graphically configure SPROCs to call, it is under the covers generating the same code (in a partial class it creates) that you'd write when using approach #2. In general I'd recommend using the LINQ to SQL designer to configure the SPROCs for the 90% case - and then in more advanced scenarios go in and custom tweak the SPROC invocation code it generates if you need to. We'll begin switching our data model to use SPROCs by starting with the Order object. Over the last year we've seen several people report having performance problems when using F5 to run/debug ASP.NET 2.0 applications using Visual Studio 2005. The problem in theses cases typically wasn't with building the project, but rather that it sometimes took the debugger a really long time to hit the first breakpoint once it attached to the application (45+ seconds and longer sometimes). In these previous LINQ to SQL blog posts I demonstrated how you could use LINQ query expressions to programmatically retrieve data from a database. In today's blog post I'll cover how you can also use database stored procedures (SPROCs) and user defined functions (UDFs) with your LINQ to SQL data model. Today's blog post will specifically cover how to call SPROCs to query and retrieve data from the database. In my next blog post in this series I'll then show how you can optionally also use SPROCs to update/insert/delete data from the database. The question of whether to use Dynamic SQL generated by an ORM or instead use Stored Procedures when building a data layer is a topic that generates endless (very passionate) debate amongst developers, architects and DBAs. A lot of people much smarter than me have written on this topic, so I won't rehash the arguments for and against each side here. 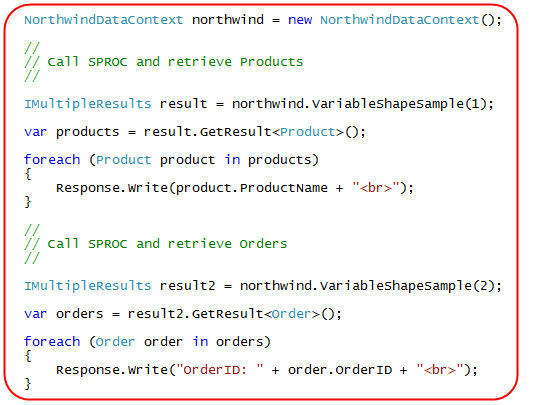 The LINQ to SQL ORM that ships in .NET 3.5 is pretty flexible, and can be used to create data model classes whose object model can be independent of the underlying database schema, and which can encapsulate business logic and validation rules that work regardless of whether the data model is populated/persisted via dynamic SQL or via SPROCs. 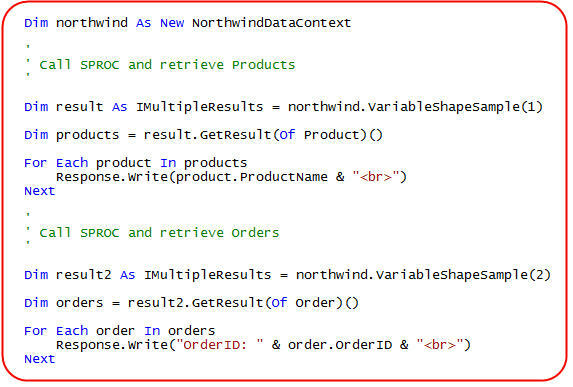 When you write LINQ query expressions like this the LINQ to SQL ORM will execute the necessary dynamic SQL for you to retrieve Product objects that matches your query. This ability to use both dynamic SQL and SPROCs with a clean data model layer is pretty powerful, and provides a great deal of flexibility when working on projects. Notice above how there are two panes on the LINQ to SQL ORM designer surface. The left pane enables us to define data model classes that map to our database. The right method pane allows us to optionally map SPROCs (and UDFs) to our LINQ to SQL DataContext object, which we can then use in-place of dynamic SQL to populate the data model objects. By default the method name created on the DataContext class will be the same as the SPROC name, and the return type of the method will be an automatically created type that follows the "[SprocName]Result" naming pattern. For example: the SPROC above would return a sequence of "CustOrderHistResult" objects. We could optionally change the name of the method by selecting it in the designer and then use the property grid to rename it. 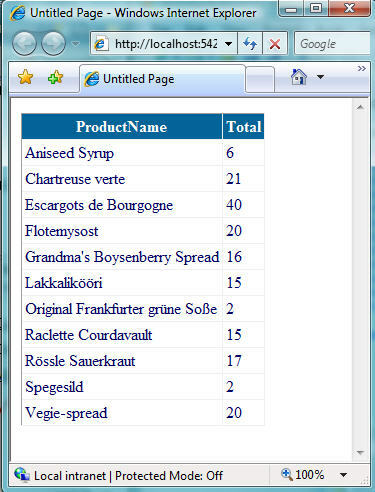 In the "CustOrderHist" SPROC example above the stored procedure returned a sequence of product history results containing two columns of data: the ProductName of the product, and the Total Number of orders the customer has made for that product. 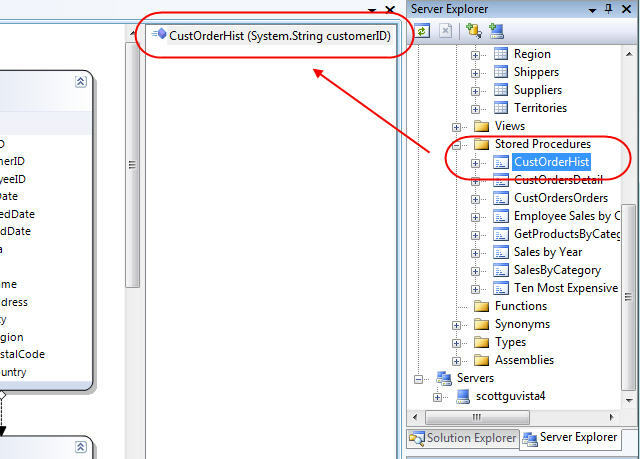 The LINQ to SQL designer automatically defined a new "CustOrderHistResult" class to represent this result. We could alternatively choose to have the return result of a SPROC map to an existing data model class we have already defined in the LINQ to SQL designer (for example: an existing Product or Order entity class). One of the cool things about having our SPROC return "Product" objects like above is that LINQ to SQL will automatically track the changes made to the returned Product objects just like it would Product objects returned via LINQ queries. When we call the "SubmitChanges()" method on our DataContext, the changes we have made to these objects will automatically be saved back to the database. When we call SubmitChanges() at the end it will transactionally update all of the product prices. To understand more about how change tracking and the SubmitChanges() method work, as well as about how Validation Business Logic can be added to data model entities, please read my LINQ to SQL Part 4: Updating our Database tutorial. In my next blog post in this LINQ to SQL series I'll also cover how you can replace the dynamic insert/update/delete SQL generated by the ORM with custom SPROCs that handle the database updates instead. The nice thing is that the code above wouldn't change at all if I configured my DataContext to use SPROCs for updates - it would purely be a mapping layer change and the code written against my data model would be oblivious to it. LINQ to SQL maps "out" parameters in SPROCs as reference parameters (ref keyword), and for value types declares the parameter as nullable. Notice in the code above how the SPROC helper method returns back a sequence of Order objects - but also then returns the CompanyName as an output parameter to the helper method. In addition to SPROCS, LINQ to SQL also supports both scalar-valued and table-valued user defined functions (UDFs), as well as the in-line counterpart to both. 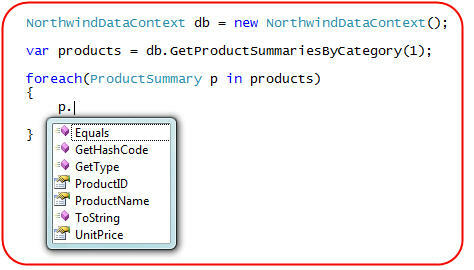 Once added to your DataContext as a method, you can use these UDF functions within your LINQ queries. LINQ to SQL supports the ability to call Stored Procedures and UDFs within the database and nicely integrate them into our data model. In this blog post I demonstrated how you can use SPROCs to easily retrieve data and populate our data model classes. In my next blog post in this series I'll cover how you can also use SPROCs to override the update/insert/delete logic when you SubmitChanges() on your DataContext to persist back to the database. One of the new controls in ASP.NET 3.5 that I think will be very popular is the <asp:ListView> control. 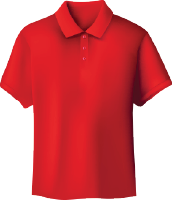 The ListView control supports the data editing, insertion, deleting, paging and sorting semantics of higher-level controls like the GridView. But - unlike the GridView - it provides you with complete control over the html markup generated. Over the last year Scott Mitchell has written 75 awesome data access tutorials covering ASP.NET 2.0 and VS 2005. You can read all of them for free on the www.asp.net site (VB and C# versions are provided for each tutorial). One of the big programming model improvements being made in .NET 3.5 is the work being done to make querying data a first class programming concept. 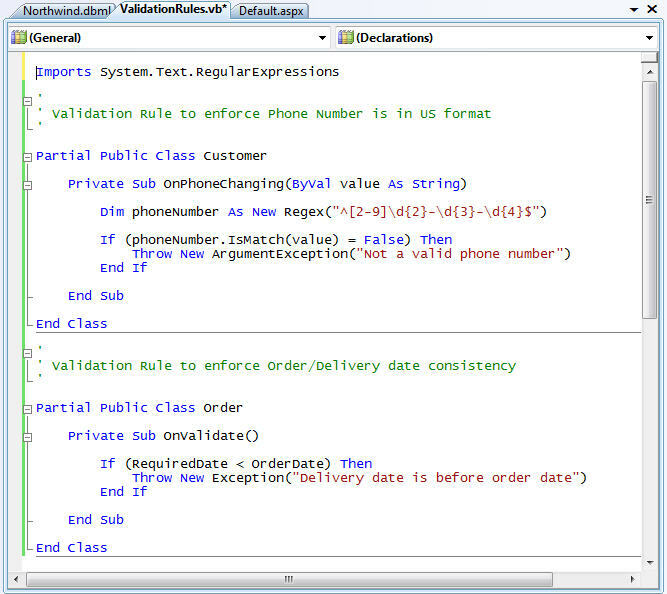 We call this overall querying programming model "LINQ", which stands for .NET Language Integrated Query. LINQ supports a rich extensibility model that facilitates the creation of efficient domain-specific providers for data sources. .NET 3.5 ships with built-in libraries that enable LINQ support against Objects, XML, and Databases. It has been a little over a week since we released Beta 2 of VS 2008 and .NET 3.5. So far the feedback from people using it has been really great. I've received a lot of emails from people saying it is the best beta we've ever shipped, and several who have moved over to using it full time for all development. Here is the latest in my semi-regular link-listing series. Today's links are all about ASP.NET AJAX. In addition to shipping VS 2008 and .NET 3.5 Beta 2 last week, my team also shipped the first release candidate of Silverlight 1.0 (it was a busy week at the office!). You can download the Silverlight 1.0 RC here. Probably the biggest programming model improvement being made in .NET 3.5 is the work being done to make querying data a first class programming concept. 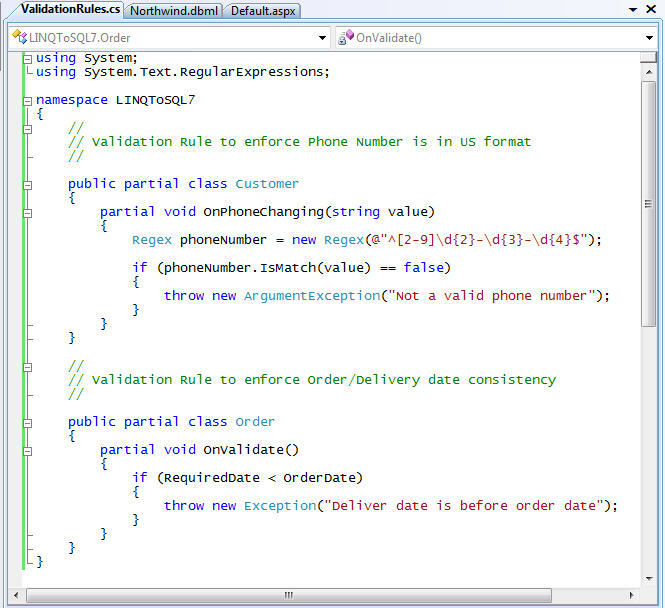 We call this overall querying programming model "LINQ", which stands for .NET Language Integrated Query. Developers can use LINQ with any data source, and built-in libraries are included with .NET 3.5 that enable LINQ support against Objects, XML, and Databases. Earlier this summer I started writing a multi-part blog series that discusses the built-in LINQ to SQL provider in .NET 3.5. LINQ to SQL is an ORM (object relational mapping) implementation that allows you to model a relational database using .NET classes. 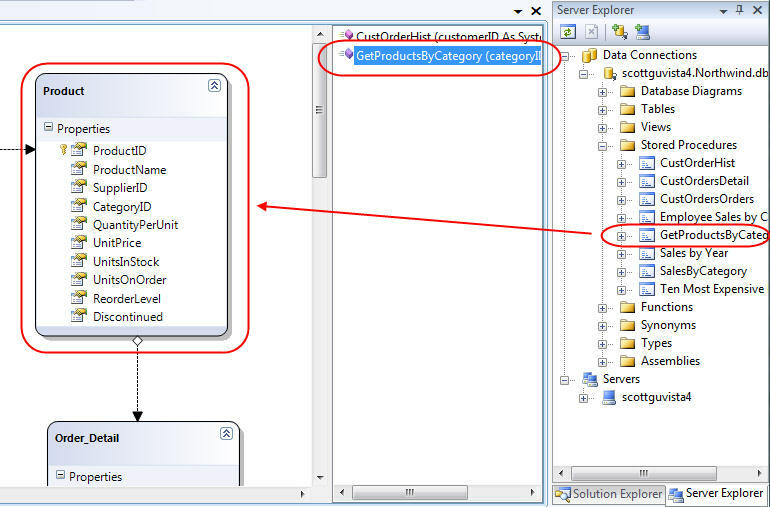 You can then query the database using LINQ, as well as update/insert/delete data from it. LINQ to SQL fully supports transactions, views, and stored procedures. 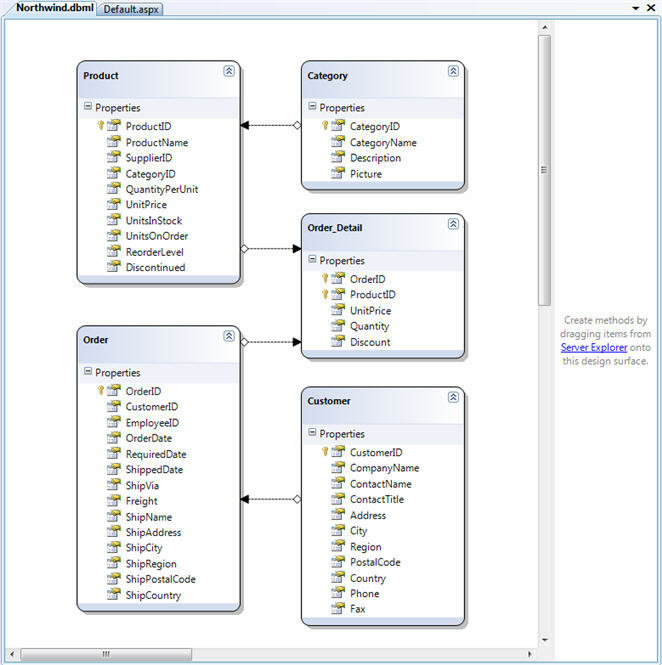 It also provides an easy way to integrate data validation and business logic rules into your data model.